Apollo Saturn V S-II Rocket on Bay Boulevard – 1965-68? This past Sunday, it was the 48th anniversary of the famous Rice Stadium speech quoted above. 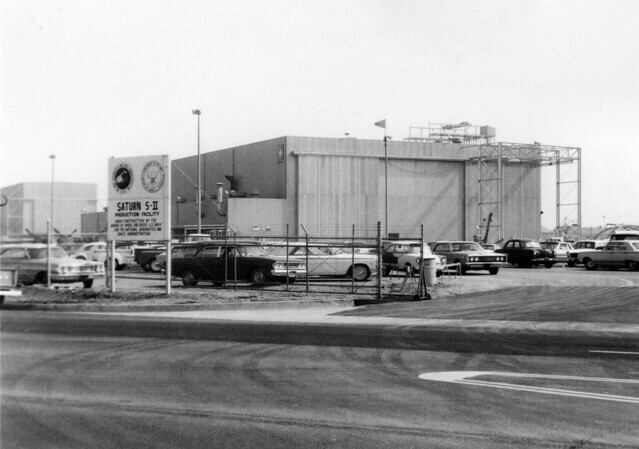 Early in that same month, a groundbreaking ceremony was held just off Bay Boulevard for the S-II Saturn assembly and test facilities to be built by the Navy for North American Aviation’s Space and Information Systems Division. This provides commemorative significance to today’s inspiring photo, which comes to us courtesy of Nancey Kredell. The next time you drive up Seal Beach Boulevard to the 405 freeway, dreading a long commute for a holiday family visit, a vacation road trip, or the rush hour stop and go conga to work, perhaps you can take some comfort in contemplating the really long commute each Saturn V S-2 rocket took going the opposite direction down Seal Beach Boulevard (still called Bay Boulevard back in the sixties). 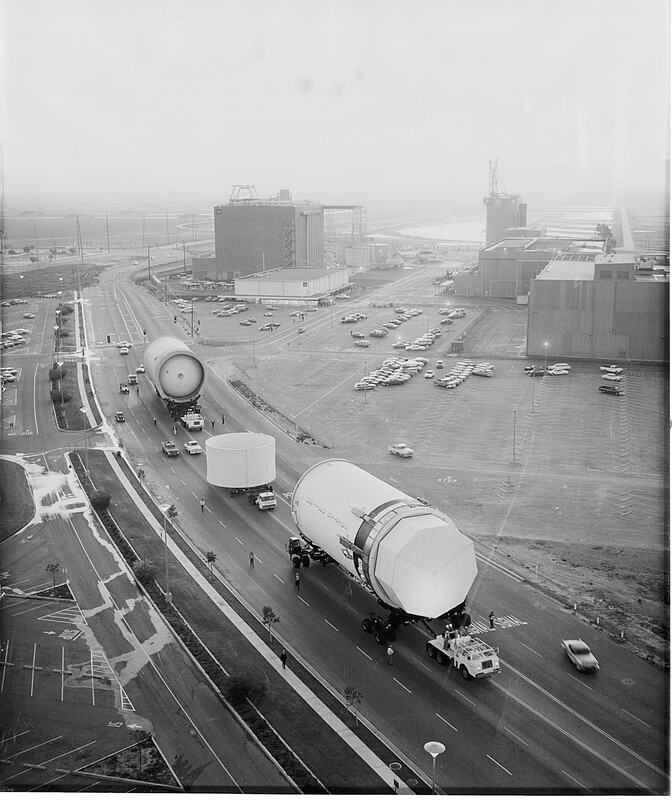 What you see in this photo are stage components for a Saturn V rocket being driven down Bay Boulevard (renamed Seal Beach Boulevard in the late sixties) to Anaheim Landing where they will be loaded on a transport (probably the U.S.N.S. Barrow Point). From Anaheim Bay, they embarked on a sixteen day journey that took them through the Panama Canal to a testing facility in Mississippi. Ultimately, they would end up on a launch pad at Cape Kennedy in Florida and would propel an Apollo spacecraft into outer space. There’s a bit of a mystery about the above photograph. The first stage in the foreground is a Saturn S-II rocket manufactured in the North American Aviation Assembly plant building in the background. The second component is the interstage engine skirt that would protect the S-II’s engines during separation from the first stage rocket after take-off. The third component is much harder to identify. It could be a Saturn S-IVB stage rocket that had been manufactured at the Douglas Aircraft plant in Huntington Beach that was returned to Seal Beach for shipping to the Kennedy Space Center on June 13, 1966. Or it might be a F-1 rocket engine that was shipped with a Saturn S-II on February 2, 1968. Or it could be some other component and date I haven’t been able to discover in my search through NASA documentation. I’m hoping a more technically adept Apollo expert will provide more information (and/or corrctions) to clear up this mystery in the comments. As an added bonus, here’s a color film footage taken from a Saturn S-II stage while in action. This was filmed on November 9, 1967 during Apollo 4’s unmanned test flight mission. First you’ll see the first stage (S-I) separate from S-II, and then the interstage engine skirt separates from the actual S-II. Finally, from the other end of the S-II, you’ll see the S-IV separate from the S-II. This entry was posted in Seal Beach History and tagged Anaheim Bay, Anaheim Landing, Apollo, Apollo Space Program, North American Aviation, S-II, Saturn S-II, Saturn V, Seal Beach. Bookmark the permalink. I turned up the volume on the computer to watch that video… of course there is no sound. The silence is more profound then any sound track could be. Thank you again for sharing! I was a 4th grade student at McGaugh school, on Bay Boulevard, in the school year 1966/1967. Some time that year, we were all rushed out of class to watch these rocket components driven past the school! I remember they seemed HUGE, and their carriers drove so s-l-o-w-l-y. How cool to see this photo now, 44 years later! This is a wonderful posting and seems to show one of the rare photos of the S-II stage in transit in Seal Beach. I’m wondering if the person who took the photo showing the S-II stage on Seal Beach Blvd. knows the specific date of when the photo was taken. In order to figure out what objects are being transported specifically, the date of the photo would be needed. I concur with the analysis that the object closest to the photographer is the S-II stage. Identification of the third object is difficult because it could be several different objects. Knowing the date of the photo would be helpful in the analysis. Unfortunately, this photo is undated. The week I posted this back in 2010, I spent hours going through the Saturn chronology that NASA has online, trying to find a description that matched this photo with no results. Recently, I got my hands on some new materials on SB’s Saturn facilities, so perhaps after I get a chance to go through those, something will turn up. I also have a photo of the trial run down Bay Blvd (now SB Blvd.) to Anaheim Landing with full-sized mock-ups of the rockets to see if the transport was viable. I hope to post it before the end of the year. It would be great if we could pin-point the event in the photo. There are some clues in the photo. One question that can help identify the specific events in the photo is the identification of which specific S-II stage is photographed. The S-II stage photographed looks to be an early version of the S-II stage. If your photo shows both a S-II stage and a S-4B moving to Alamitos Bay simultaneously, the shipping dates would have to coincide for both stages. The S-4B was manufactured at Douglas (Huntington Beach) and the S-II stage was manufactured out of North American (Seal Beach). This web page lists the various S-II stages and S-4B stages that were planned and describes key information related to each stage. In looking through entries for the Test Stages, S-4B-F is said to be completed in “early 1965” and “Delivered to Sacramento for testing March 1965”. S-2-T is said to be “completed 2-9-1965” and is reported moved to “Santa Susana” for “static propulsion testing” with “First cluster ignition test on 4-24-1965”. If anyone would be able to confirm these dates of movement and the specific events in the photo, there could be a library at Boeing which would be able to shed light on the exact timing of movement of the stages. I have latched on to the S-II-T stage as being in the photo because that particular stage is seen in photos from Mississippi as the S-II-T stage was being erected on the A-2 test stand for testing. The markings on the S-II-T stage appear to match the image in the photo. Subsequent S-II stages used for actual flight operations had slightly different paint schemes with a hashed line visible on the stage to the left of the “United States”. In this Youtube video, the initial scene is probably S-II-T in transit. The test stand sequence shows the static firing of the S-II-T in its first test at NASA MTF. You can see sheets of ice falling off the stage during the firing. Therefore, there is a possibility that your hunch is correct and the photo correlates to both stages rolling to the port for testing purposes. This could have occurred in March 1965 IF S-4B-F and S-2-T were sent down Bay Blvd in March 1965. Driving home past here tonight I was shocked to see what must be the building in the second photo as just a huge heap of rubble… Now home and looking for info on what all is going on or coming down there with out specific names to search for this post is first thing I found…. I did not have time to stop and photograph it but if I can’t find any photo’s of the tear down online I will go back in the morning and try to get some…… Of use now or not I hate seeing the old especially places that are connected to such history as when we went to the moon, vanish before my eyes. It is sad, but my understanding is that these building are not structurally sound and have stood decades past the expiration date. In a perfect world, we could convert the taller building with the bay doors into a Southern California aerospace museum, but the political will and the money just isn’t there for such a monumental task. The good news is that a few years back the entire Saturn complex was photographed and documented for historical archives so we’re not facing the all too typical situation of no record of the interior or details of the buildings.